This week the government unveiled the biggest cuts to public spending in decades. The regressive, unfair cuts (source: IFS), will lead to 500,000 job losses, with services up and down the country severely cut or axed completely. Johann Hari, in The Independent, described Britain as a "colder, crueller country" in the wake of the cuts. 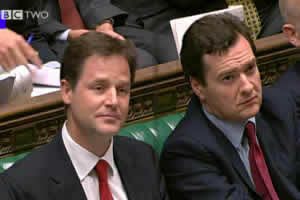 • This week the government unveiled the biggest cuts to public spending in decades. The regressive, unfair cuts (source: IFS), will lead to 500,000 job losses, with services up and down the country severely cut or axed completely. On Left Foot Forward, we looked at whether the ‘ring fenced’ health budget had actually been cut; how the huge cuts to DECC and DEFRA had hit the Tories’ green claims; the chancellor’s false fairness claims; capital investment appearing to favour the south over the north; the anger in Scotland, Wales and Northern Ireland; questions over development aid; the weakening of work incentives; the IFS’s devastating analysis; the fact local councils will be amongst the biggest losers; the fact that families will be hit twice as hard as banks; voters’ discontent over the cuts (and how The Sun tried to cover this up); and how scrapping EMAs will force many 16-19 year olds to leave school. In the Commons debate on the defence review, the prime minister described it as “more thoughtful, more strategic and more co-ordinated” than its 1998 predecessor, while Ed Miliband called it “a spending review dressed up as a defence review”. At the weekend, US Secretary of State Hillary Clinton and the Chief of the General Staff had voiced their concerns ahead of the review, with the Ministry of Defence eventually agreeing to an 8 per cent cut in its budget, resulting in 7,000 fewer troops, fewer aircraft carriers for the Royal Navy and RAF bases closing. • On Monday, the issue of Tory tax avoidance reared its head. Channel Four’s Dispatches programme accused chancellor George Osborne, international development secretary Andrew Mitchell, and transport secretary Philip Hammond of saving millions in taxes. It was revealed that Mitchell invested at least £130,000 into offshore investment funds, one of which is based in the Caribbean tax haven of the British Virgin Islands; Hammond transferred some of his assets over to his wife, resulting in a much-reduced tax bill for the millionaire; and Mr Osborne, who this week unveiled swingeing cuts to our public services, will not have to pay any inheritance tax on the death of his father – a saving of up to £1.6 million. All in this together? Really?! President Obama, who this week backed the ‘It Gets Better Project‘, which calls on people to take the following pledge: “Everyone deserves to be respected for who they are. I pledge to spread this message to my friends, family and neighbours. I’ll speak up against hate and intolerance whenever I see it, at school and at work. I’ll provide hope for lesbian, gay, bi, trans and other bullied teens by letting them know that “It Gets Better”.” “The president released a video in support of the project. Wayne Rooney, whose grubby, unseemly conduct shamed himself, his profession, and his sport. In the week in which millions of young people faced up to a bleaker, less prosperous future in the wake of the coalition’s savage cuts to schools, universities and jobs, Rooney’s selfish behaviour, culminating in him signing a new contract this afternoon, showed football at its greediest, irresponsible worst and made the great game that little bit less beautiful. The reams of research showing the unfair and regressive nature of the Comprehensive Spending Review. While it took a few days for the horrors of the emergency budget to be brought to the fore, within hours of the CSR many of the coalition’s claims had been comprehensively rebutted. Straight after the speech, Demos’s Sonia Sodha checked the chancellor’s claim that poorer families would feel less of an impact than rich families, as did the New Statesman’s George Eaton, while on Left Foot Forward Tim Horton and Sunder Katwala used the Treasury’s own figures to drum home the point. Then, on Thursday, came the coup de grâce, with the respected and independent Institute for Fiscal Studies proving the CSR’s tax and benefit changes are “regressive”, and today, Next Left revealed how the CSR cuts will hit the poorest “15 times harder” than the rich. In Wales, Plaid Cymru leader and deputy first minister, Ieuan Wyn Jones, described the spending plans as a “devastating blow to the Welsh economy”. First minster Carwyn Jones echoed his deputy, expressing his concerns that the cuts to Wales would “endanger the fragile economic recovery and threaten devastating and long term consequences for the most vulnerable people in our society”. Shamik, that’s an interesting point about Rooney. It seemed to me like in his innicial statement he seemed to blaim the lack of money Man United had. .The biggest cuts to public spending in decades’.According to the ECB,the Howe cuts in 1981 were 8.2 %,compared to these 7.5% cuts, dwarfed by Finland(1993) and Sweden (1993)both 14 %,or Ireland and Belgium (1982/3)both 12%.Incorrect slogans will get us nowhere.The Lamont/Clarke cuts of 7.5(1992),like the Howe cuts ,preceded long periods of Labour in opposition.The most successful Eu country in terms of GDP growth is Germany,not a disciple of no more boom or bust fiscal policies courtesy of GB.Can we have some realism,please, before the next election, or do we have to wait until 2028? In 2008 Johann Hari called on the government to enforce wartime-style rationing in order to save the planet from almost certain fiery doom. “Just as the government in the Second World War did not ask people to eat less voluntarily, governments today cannot ask us to burn fewer greenhouse gases voluntarily”, said Hari. No, it must “force us all” to live more frugally and sensibly – be careful what you wish for, you just might get it. Wayne Rooney is regressive of the week? How much extra tax did he just sign up to pay? What Wayne is doing is actually a progressive move. He’s doing his bit to close the deficit so that the poor don’t have to. You should be celebrating that. Rich man to pay more tax – isn’t that what you want? Indeed Mark M, rich person gets paid a bit more by an even richer one. Boo hoo, whatever will become of us.